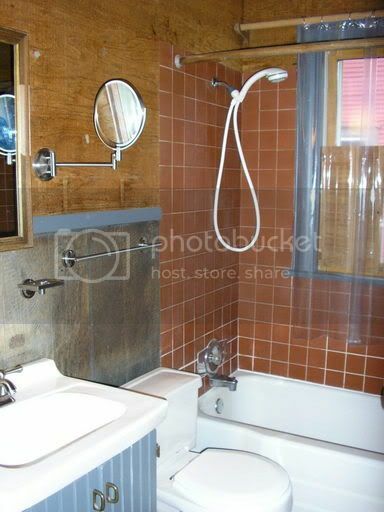 For purposes of comparison, here’s Sheila’s bathroom as it was before they remodeled. 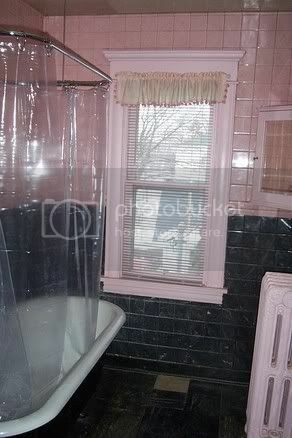 While the valance with the dangling balls is, well, unspeakable, and the pink radiator is laughable, I think our plywood walls and brown tile put us over the edge. I didn’t know that when you have a mammogram, you have to stand with no shirt on while a nurse watches as you wipe off your deodorant and then flattens out your breast on a little plate, smashes it down with another plate and yells, “Don’t move at all! Don’t move at all!” as she generates pictures of your fatty tissue. There’s a lot of breast handling by the nurse, who is, of course, a total stranger. Lucky for me, my thickening magically disappeared between last week and this, and I don’t have do this again until I’m 40. 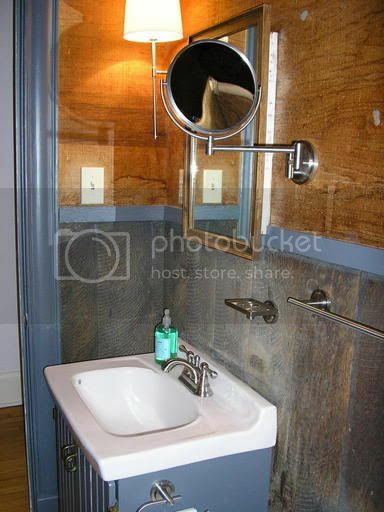 Sheila thought there couldn’t possibly be a bathroom uglier than hers was, but I beg to differ. The rest of our new house is nicer. Erin gave me some dynamite advice last week on how to make our kitchen look bigger: We now keep all small appliances and cooking utensils in the basement. This, I thought, was a terrific idea. Where I used to crowd the coffee maker, toaster oven, and a carafe of spatulas and wooden spoons, I now display a glass bowl filled with lemons and limes. I’m not kidding; it’s very Martha. Now, if I want to toast a bagel or make some coffee, all I have to do is put the baby someplace where he’s prevented from licking outlets or eating flotsam from the floor, race down the basement steps to the soundtrack of the screaming, confined child; lift the needed appliance from the table that we stashed down there in order to make our porch look bigger, and return breathless to the kitchen after rescuing Shef, who is obviously and massively spoiled. I’d be extraordinarily crabby about this situation if I hadn’t gotten the news this morning that I’ll be gainfully employed next year teaching tenth grade English, so I can buy coffee on the way to work instead of hustling up and down the basement stairs to make it.